MedicalConspiracies- Fw: Is violence about to erupt in your town Tuesday? Is violence about to erupt in your town Tuesday? May Day isn't just for Commies anymore, and at least one American mayor fears the worst, warning that protesters may use Occupy May Day events tomorrow to "commit violence, damage property and disrupt peaceful free-speech activity." It just gets more mysterious. Medical examiners in Los Angeles are now investigating the possible poisoning death of one of their own officials who may have worked on the case of Andrew Breitbart, the conservative activist who died March 1, the same day Sheriff Joe Arpaio announced probable cause for forgery in President Obama's birth certificate. FED PLAYING POLITICS WITH OUR MONEY? The Federal Reserve, America's central bank, was supposed to be politically neutral and to keep the U.S. Dollar sound as a dollar. 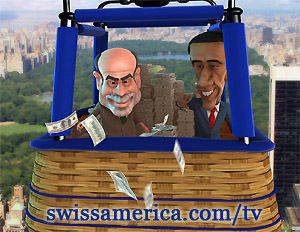 "But the Fed can tilt an election by producing lots of money from thin air to create the illusion of prosperity," says monetary expert and author Craig R. Smith. "Congressman Kevin Brady (R.-Texas) is proposing the Sound Money Act to reduce the Fed's mandate to only one thing - keeping prices stable," says Smith. "Using the Fed's statistics we could face massive inflation or hyper-inflation by 2018. Non-government agencies say it could occur by 2014." Free CD: "The Future of Money"
Charles Darwin tarred, feathered by … Pirates! Make WND your homepage today! Do you suspect Andrew Breitbart's death was NOT from natural causes? Is America under God's judgment? - $4.95 today only! To unsubscribe or to change your email preferences, click here. If you are interested in advertising with WND.com, the leading independent news source on the Net, email advertising@wnd.com. Copyright 1997-2011 WND.com Inc. All Rights Reserved. THIS IS A MANDATORY KEEPER !!!!! Some of you will receive this twice as I'm sending to two lists. I KNOW that some of you live in rurral America where Brown Recluse, and other, Spiders are a serious concern. If you already know this informationn, GREAT ! If not, you now have what appears to be an effectiive, even life saving, CURE for their bites. I'm saving, printing, and giving a copy to my PCP. Feel free to forward, especially to your rural buds.. WARNING !!!!! Contains graphic Recluse Spider Bite photo. There is a secret plan to evacuate Chicago in the event of trouble due to the upcoming NATO summit May 20-21 taking place at McCormick Place (the largest convention center in the United States). The Red Cross in Milwaukee is preparing to shelter Chicagoans if they need to be relocated. A Red Cross email sent out to volunteers, and obtained by CBS 2 News in Chicago, messaged the plan to evacuate residents of Chicago in the event of 'trouble' during the NATO summit in May. …this conference may create unrest or another national security incident… the American Red Cross in eastern Wisconsin has been asked to place a number of shelters on standby in the event of evacuations from Chicago. When questioned about the plan, the Red Cross said in a statement "Our direction has come from the city of Chicago and the secret service". A 'False Flag' in the making? Also of note, the federal government's decision to create a militarized "Red Zone" in the Loop (the commercial center, theater and shopping district of downtown Chicago) and extended throughout the south Loop area often referred to as the federal complex, in the run-up to the NATO summit. "A lot of us were surprised to read that. Obviously, the federal government doesn't consult with the city when they do this. Everybody was unaware of this," said Host Committee Executive Director Lori Healey, reported from the Chicago Sun-Times. The plan for "Operation Red Zone" kicks into high gear beginning May 1, "to protect a vast area in the Loop where thousands of federal employees and dozens of government offices are located". The official designated Red Zone is said to be between State-and-Franklin, and Harrison-and-Adams including the financial district according to a report from WGN Chicago. Potentially the first martial law zone? Breaking: Newt Gingrich to end presidential bid on Wednesday, source says 29 Apr 2012 Newt Gingrich will end his bid for the Republican presidential nomination on Wednesday in Washington, D.C., a source close to the former House speaker told CNN. Previous reports said Gingrich would likely quit the race on Tuesday. Gingrich is expected to express his support for likely GOP nominee [Rove-bought] Mitt Romney. The decision to make the announcement this week was due to logistical reasons, sources told CNN last week. Milwaukee Red Cross Told to Prep For Chicago Evacuation During NATO Summit --'Our direction has come from the City of Chicago and the Secret Service.' 25 Apr 2012 Is there a secret plan to evacuate some residents of Chicago in the event of major trouble a false flag during the NATO summit next month? CBS 2 has uncovered some evidence that there is -- from the Milwaukee area branch of the American Red Cross. CBS 2 News has obtained a copy of a Red Cross e-mail sent to volunteers in the Milwaukee area. It said the NATO summit "may create unrest or another national security incident. The American Red Cross in southeastern Wisconsin has been asked to place a number of shelters on standby in the event of evacuation of Chicago." US police state gone wild: Federal agents to begin 'Operation Red Zone' in Chicago 26 Apr 2012 Starting next week, expect to see a showing of federal law enforcement in "battle" gear, weapons slung, in a highly visible effort to protect a perimeter that encompasses the federally operated buildings in the Loop intimidate protesters. Law enforcement has dubbed their efforts "Operation Red Zone." It's headed by the Federal Protective Service, which is working with state, federal and local law enforcement in anticipation of the NATO Summit in Chicago on May 20 and 21. The Federal Protective Service will deploy additional personnel beginning May 1, bringing in more people from out of town and outfitting them in "battle dress uniform." To Joliet Jail for NATO offenders? 29 Apr 2012 Mothballed for a decade, the Joliet Correctional Center could be temporarily reopened to serve as a detention facility for those arrested for serious offenses during the May 20-21 NATO summit. Cook County Sheriff Tom Dart says his first choice was to use Division 3 at Cook County Jail before the once-empty division had to be filled with detainees [?!?] over the last two months... Dart said the solution that makes the most sense is Joliet, the hulk of a prison facility mothballed in 2002. UK police state gone wild: Surface-to-air missiles on top of flats to protect Olympics as part of huge security operation --Ministry of Defence confirmed missiles would be deployed within next few days 28 Apr 2012 Ground-to-air missiles are to be sited on the roof of a block of flats near the Olympic site as part of a huge security operation to protect the Games. The Army will station soldiers and high-velocity surface-to-air missiles on the residential block in East London to ward off airborne terror threats. Residents in the private, gated flats in Bow have received a leaflet warning them that a team of ten soldiers and police will be placed at the building - home to 700 people - for the duration of this summer's Games. The chilling (and balaclava-clad) face of modern British policing: London siege reveals armed-to-the-teeth team preparing for the Olympic Games 27 Apr 2012 Bristling with guns, his face masked, a police officer moves in on a suspected suicide bomber. Just 91 days away from the start of the Olympics, the dramatic scene gave a foretaste of what can be expected this summer after a man threatened to blow himself up in a busy office block. Thousands were evacuated, Tube stations were closed and streets locked down over a wide area of London's West End. Snipers, bomb disposal squads, nuclear biological and chemical warfare specialists and dozens of armed police were scrambled to the building on Tottenham scrambled to an office block on Tottenham Court Road, one of the city's busiest shopping streets. UK police cordon off central London 27 Apr 2012 British police have closed London's Tottenham Court Road amid reports of a hostage incident. Police have been called to a potential hostage situation after one of the country's busiest shopping streets was closed. Businesses and shoppers were evacuated from Tottenham Court Road in central London at midday. The Huffington Post's UK Executive Editor Stephen Hull, who is in Tottenham Court Road, has tweeted unconfirmed reports that a man wearing "four canisters" threatened to "blow himself up" in a logistics office. U.S. Amasses Stealth-Jet Armada Near Iran 27 Apr 2012 The U.S. Air Force is quietly assembling the world's most powerful air-to-air fighting team at bases near Iran. Stealthy F-22 Raptors on their first front-line deployment have joined a potent mix of active-duty and Air National Guard F-15 Eagles, including some fitted with the latest advanced radars. The Raptor-Eagle team has been honing special tactics for clearing the air of Iranian fighters in the event of war. The fighters join a growing naval armada that includes Navy carriers, submarines, cruisers and destroyers plus patrol boats and minesweepers enhanced with the latest close-in weaponry. Lebanon stops ship with Syria-bound weapons --Ship originally from Libya and loaded with arms reportedly destined for Syrian opposition is stopped by Lebanese navy 28 Apr 2012 The Lebanese navy has reportedly intercepted a ship loaded with three containers of weapons destined for Syrian opposition forces. The cargo vessel, which originated from Libya, was found on Saturday. Pictures released by the army showed dozens of crates inside the containers, some of them filled with belts of heavy ammunition and rocket-propelled grenades. A security official said the Sierre Leone-flagged Lutfallah II was bound for members of the Free Syrian Army, an umbrella group of fighters [US-backed terrorists] trying to overthrow the government of Bashar al-Assad, the Syrian president. Report: NATO Misleads With 'Afghan-Led' Label 25 Apr 2012 A new report Wednesday by a Kabul-based think tank accuses international forces of misleading the public by calling military operations "Afghan-led" even in cases where NATO or U.S. forces are the only troops on the ground. In the transition [NATO to hand over security to Afghan control], one phrase -- "Afghan-led" -- has become increasingly prevalent in NATO and U.S. news releases describing operations. The report charges alleges that the term has been so loosely applied that it has, in at least once instance, been used for an assault conducted entirely by U.S. troops. Elite Afghan soldier kills U.S. special forces mentor 28 Apr 2012 An elite Afghan soldier shot dead an American mentor and his translator at a U.S. base, Afghan officials said on Friday. The soldier opened fire at an American military base on Wednesday in Shah Wali Kot district, in Kandahar province, said General Abdul Hamid, the commander of Afghan army forces in the Taliban's southern heartland. At least 18 foreign soldiers have died this year in 11 incidents of so-called green-on-blue shootings. Images of 'Osama bin Laden' killing not to be released, judge orders --A US federal court has backed the Obama administration in refusing to release pictures or video from military operation [Osama bin Laden died in December 2001.] 26 Apr 2012 A federal judge has refused to order Barack Obama's administration to release pictures and video of the US military operation that [the US claims] killed al-Qaida leader Osama bin Laden in Pakistan almost a year ago. The government watchdog group, Judicial Watch, had requested that the defence department and Central Intelligence Agency release any pictures or video footage of the operation on 1 May 2011 that killed Bin Laden in Abbottabad, Pakistan. The defence department said it had no pictures or videos sought by the group and the CIA said it had 52 such records, but refused to release them. Senate probe finds little evidence of effective 'torture' 27 Apr 2012 A nearly three-year-long investigation by Senate Intelligence Committee Democrats is expected to find there is little evidence the harsh "enhanced interrogation techniques" the CIA used on high-value prisoners produced counter-terrorism breakthroughs. People familiar with the inquiry said committee investigators, who have been poring over records from the regime of President [sic] George W. Bush, believe they do not substantiate claims by some Bush supporters that the harsh interrogations led to counter-terrorism coups. Judge retains the biggest charge in WikiLeaks case 27 Apr 2012 A military judge refused on Thursday to dismiss the most serious charge against an Army private accused in the biggest leak of government secrets in U.S. history. Col. Denise Lind rejected a defense motion to throw out the charge of "aiding the enemy" during a pretrial hearing for Pfc. Bradley Manning. The charge carries a maximum penalty of life in prison. It was one of several motions seeking to dismiss some or all of the charges, but Lind left all 22 counts against Manning in place. Heads up! FDA approves antibiotic to treat, prevent plague 28 Apr 2012 U.S. regulators have approved use of a powerful Johnson & Johnson antibiotic to treat plague, an extremely rare [except when cultivated in US labs], sometimes-deadly bacterial infection. The Food and Drug Administration also approved Levaquin, known generically as levofloxacin, to reduce risk of people getting plague after exposure to the bacteria that cause it. Called Yersinia pestis, the bacteria are considered a potential bioterrorism agent. Jellyfish-Like Organisms Shut Down California Power Plant --Salp were clogging traveling screens in intake structure 26 Apr 2012 The workers of the [Pacific Gas & Electric] Diablo Canyon nuclear power plant received a slimy surprise this week when they discovered hoards of jellyfish-like creatures clinging to the structure, leading to the shutdown of the plant. The organisms, called salp, are small sea creatures with a consistency similar to jellyfish. The plant consists of two units. Unit 1 was shut down previously because of refueling and maintenance work and will not be functional for several weeks. U.S. ban sought on cell phone use while driving 26 Apr 2012 U.S. Transportation Secretary Ray LaHood called on Thursday for a federal law to ban talking on a cell phone or texting while driving any type of vehicle on any road in the country. Tough federal legislation is the only way to deal with what he called a "national epidemic," he said at a distracted-driving summit in San Antonio, Texas, that drew doctors, advocates and government officials. LaHood has previously criticized behind-the-wheel use of cell phones and other devices, but calling for a federal law prohibiting the practice takes his effort to a new level. Nancy Pelosi ways would back plan that cuts Social Security, Medicare 27 Apr 2012 Two progressive organizations have found themselves in the unusual position of being on the opposite side of House DemocRATic Leader Nancy Pelosi. Over the course of the past two years, the former House Speaker has been the most significant obstacle to the ongoing effort to slash entitlements and cut social spending. But a series of recent comments, and reports that Pelosi was willing to accept draconian cuts as part of a debt-ceiling deal, have liberals worried that their most powerful and passionate defender may be buckling on the issue. Central, eastern Europe swelter in record heat 28 Apr 2012 Summer came early to central and eastern Europe as unseasonably high temperatures were recorded Saturday in several parts of Germany, Austria and the Czech Republic. Temperatures "are exceptionally mild for April", Austria's ZAMG meteorological centre said, reporting a record 32 Celsius (90 Fahrenheit) in the northern region of Lower Austria. Prague experienced its hottest April 28 in 212 years, with mercury hitting 27.7 Celsius (82 Fahrenheit) while unusually high temperatures were also recorded in Poland and Slovakia. CLG Editor-in-Chief: Lori Price. CLG Chair: Michael Rectenwald, Ph.D. Copyright © 2012, Citizens for Legitimate Government ® All rights reserved. With all the cops acting like Yosemite Sam on a tear lately, I forward this to help pet owners keep their animals safe from the cops. "The net poses a fundamental threat not only to the authority of the government, but to all authority, because it permits people to organize, think, and influence one another without any institutional supervision whatsoever." - John Seabrook. American journalist at The New Yorker since 1993. When the news media tells you something is good for you - it is bad for you. When the news media tells you something is bad for you - it is good for you. When the news media tells you that they are reporting the truth - they are lying! When the news media tells you they only have a few facts about a particular story or event what they aren't telling you is everything they really know to be true about that particular story or event. When the news media goes on for days or weeks or months about a particular story which has no other value than meaningless gossip or trivia what they are REALLY doing is using that story as NEWS FILLER to take up air time so as to avoid reporting the TRUTH to you of what is really going on in your home town or in America. When the news media goes on for days or weeks or months about a particular story they are working an agenda to change your mind so you believe what they are TELLING you to believe. And lastly, you are 100% guaranteed that the Government-Corporate news media propaganda machine will lie to your face in print (Newspapers and magazines), on TV or on the radio. What's worse, they will use sibliminal, visual messages, blatant visual messages and obvious verbal messages on TV to make you believe that a lie is the truth and the truth is a lie. And, to make matters worse - whether or not you want to believe it - those lies *WILL* work at brainwashing you via your subconscious. You might say to yourself, CONSCIOUSLY, that what you have been seeing on TV or reading in the newspapers is pure B.S., but your subsconscious *HAS* been affected by what you saw on TV or read in the newspapers over time. Want to find out if you've been brainwashed - but don't know if you've been brainwashed? There's a real easy way to find out, you know! Do you *NOT* own a firearm because you think they are too dangerous to have at home? Have you been told over and over, again and again over the years by different TV programs, anti-gun newspaper articles, government agencie reports and by anti-gun organizations that firearms are too dangerous to keep at home for your own protection? Yet.....Do you still believe that you and others have a 2nd Amendment RIGHT to keep and bear arms if you want to? Do you still believe that the 2nd Amendment of the Bill of Rights guarantees you that RIGHT to own a firearm?? Ok, if you feel this way, make a conscious, determined decision that you *ARE* going to exercise your *RIGHT*, under the 2nd Amendment, to keep and bear arms - that you are going to go down to a gun shop in the town where you live and buy a 38 caliber revolver pistol or maybe a 357 magnum revolver pistol for your own personal protection at home. Make sure that you are committed to buying a firearm that day for your own protection. Those two calibers of firearms are really good and reliable firearms for personal protection - especially as a concealed carry firearm. *NOW* COMES THE REAL INTERESTING PART! After you have said to yourself that YOU HAVE A RIGHT to own a firearm for your own protection and you ARE going to buy a gun today and as you get ready to leave the house.....as you get into your car.......as you drive your car to the gun shop....as you park your car in the gun shop parking lot or on the street by the curb in front of the gun shop.....and as you get out of your car......and as you start to walk toward that gun shop door WHAT ARE YOU FEELING? WHAT ARE *YOUR THOUGHTS* as this is happening?? I'm not going to go any further than that. If you want, you can keep your "experience" to yourself or, if you want, write to me at leslemke@webenet.net and tell me how that experience went....what were your feeling and what kind of thoughts were going through your mind as you drove to and then proceded to walk toward that gun shop door to buy your first firearm. If you do decide to write to me personally ( use my email address above ) about your experience I will write a reply letter back to you....to let you know that you were very definately not alone in your "experience." On the subject line just put: BRAINWASHED in your reply or simply reply to this message...sending the message to my email address above. The news media in the U.S.A. is nothing but the lying, propaganda and brainwashing arm of the turncoat U.S. Government as ell as the UnAmerican corporations, globalists, banks and elite, who are working both right in front of your eyes as well as behind the scenes to your detriment. They and others like them are working to destroy the U.S. Constitution, the Bill of Rights and this very country itself! – Autobiography: BBC Director-General, Greg Dyke. Mail on Sunday. October 24 2004. - Simon Heffer, Daily Mail, June 7 2000. - Bjurstedt Mallory, Chicago Tribune, February 7 1923. - Roger Tarterian, Editor, United Press International, March 8 1967. - Sir. Charles Curran, BBC, 10 October 1970. - Matthew Pariss. British Press Awards Columnist of the Year. Daily Mail, April 21 1996. - Stanley Baldwin, British Prime Minister 1924-1929 and 1935-1937. - Gen. William Westmoreland, Washington D.C. 22 April 1978. - The New Frontier of War, U.S Department of Defence. - Sir Peter Hall, Theatre Director. - Adolf Hitler. Mein Kampf. Except he who the truth would indict. *** exposing the hidden truth for further educational research only *** CAVEAT LECTOR *** In accordance with Title 17 U.S.C. Section 107, this material is distributed without profit to those who have expressed a prior interest in receiving the included information for research and educational purposes. *** Revealing the hidden Truth For Educational & Further Research Purposes only. IF anyone other than the addressee of this e-mail is reading it, you are in violation of the 1st & 4th Amendments to the Constitution of the United States. Patriot Act 5 & H.R. 1955 Disclaimer Notice: This post & all my past & future posts represent parody & satire & are all intended for intellectual entertainment only. To be removed from the truth news list, please reply with the subject line "REMOVE"
(NaturalNews) Certain foods and chemical additives disguised as food can aggravate or cause muscle and joint pain associated with arthritis, gout and fibromyalgia. Avoiding these foods can pave the way for reduced inflammation, stiffness and pain - setting the stage for ongoing relief, with increased mobility and a better mental attitude. Although it may be a challenge to avoid well-loved foods, keep in mind that many of those foods are causing widespread systemic problems that result in debilitating pain, so they are not your friends. The nightshade vegetables are lesser-known offenders; however, for some people, eating any nightshade can cause excruciating pain and disability. This small family of vegetables contains a natural substance called solanine; when consumed, it can produce severe pain in the joints and the soft tissue, giving rise to arthritis and fibromyalgia flare-ups. The nightshades include tomatoes, peppers, white potatoes, eggplant and tobacco. Because several of these vegetables are included in so many recipes, special attention must be given to eliminating them from the diet. Smokers suffering from arthritis might view the possible cause and effect relationship of tobacco on their condition. Purines are the byproduct of protein digestion, and they break down into uric acid, the main cause of gout. All proteins produce some purines; however, eating certain types of protein is more likely to create a gout flare. Red meats, organ meats and shellfish are considered particularly harmful. Some people are more sensitive to one protein, so each should be monitored for its effects on the disease. Vegetable-based proteins, lean organic poultry and fresh fish are excellent substitutes for those foods eliminated. Wheat and wheat gluten are implicated in several diseases, including certain types of arthritis, fibromyalgia, and digestive disorders such as irritable bowel syndrome, Crohn's and celiac disease. Wheat and gluten are especially harmful to the body when highly processed, as in white flour where nutrients are completely stripped from the grain. Less sensitive people are able to eat sprouted wheat products without negative effects; however, eating a gluten-free diet may help reduce most painful joint symptoms. Research has shown that eating trans fats can contribute to musculoskeletal pain and aggravate gout, arthritis and a host of other conditions. A diet including regular consumption of fat-laden proteins found in most fast foods may aggravate or cause pain for many people with these conditions. Replace bad fats with healthy fats found in avocados, olives, coconuts, flax seeds and their oils. Food additives and preservatives and artificial sweeteners are used in almost all packaged products; and they can cause a wide range of mental and physical symptoms including joint and muscle pain. MSG -- in all of its disguises -- is known to create a multiplicity of symptoms, especially in those who are sensitive to this chemical. Severe joint and body pain, cognitive dysfunction, dizziness and headaches are just a few of the side effects. Artificial sweeteners stimulate the pancreas causing an imbalance in insulin and blood sugar levels and can produce body aches and pains as well as severe digestive disorders and cancers. Replace MSG with spices to flavor foods and use natural foods like raw honey and stevia as sweeteners. Most people should experience a reduction in their muscle and joint pain and an overall improvement in their conditions after a period of avoiding these offending foods. Always consult a health practitioner before making any major changes in your diet.